Zohrab Center interns and the ZIC Director, Fr. Daniel Findikyan, flank Dr. Roger S. Wieck, Curator of Medieval and Renaissance Manuscripts at the Pierpont Morgan Library. The Zohrab Center’s three freshly-branded college interns began their term of learning and service with a visit to New York’s world-renowned Pierpont-Morgan Library to view an exhibit of medieval manuscript illuminations of the Eucharist. Entitled, Illuminating Faith: The Eucharist in Medieval Life and Art, the exhibit featured some of the Morgan’s finest European manuscripts dating from the 12th through the 15th centuries. 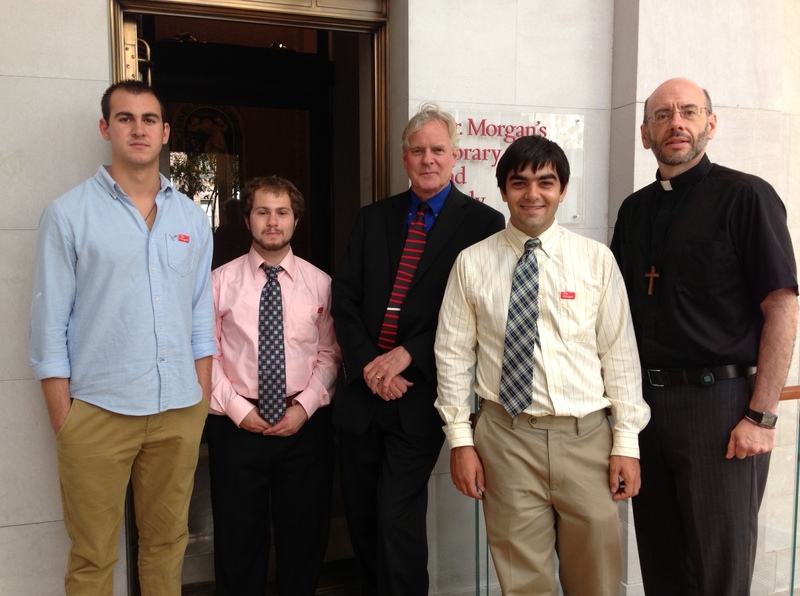 Through the kindness of New York-based journalist Florence Avakian, the interns and the director, Fr. Daniel Findikyan, met personally with Roger S. Wieck, Curator of Medieval and Renaissance Manuscripts. Dr. Wieck led the Zohrab group through the magnificent Morgan Library and the original steel-encased vault, which houses the Morgan’s vast manuscript collection. The Pierpont-Morgan Library holds the largest collection of Armenian manuscripts in the United States. Many were shown at a 1993 exhibit there entitled, Treasures in Heaven: Armenian Illuminated Manuscripts. The Zohrab Center autumn interns are: Andrew Kayaian, a sophomore history major at Fordham University; Alek Hadadan, a junior majoring in Business at Manhattanville College, (Purchase, NY), and Christopher Piric, a sophomore linguistics major at Nassau Community College. “The Zohrab Center internship program provides college students in the New York metropolitan area with the opportunity to serve the Center and the Armenian Diocese, while deepening their knowledge and appreciation for Armenian Studies, culture and civilization,” said Fr. Findikyan. “Our visit to the Eucharist exhibit at the Morgan allowed us to compare depictions of the central worship act of the church in the Armenian and western European traditions,” he noted.